There is more activity around this afternoon and showers extend further south and east than was forecast by the 06 UTC WRF runs. 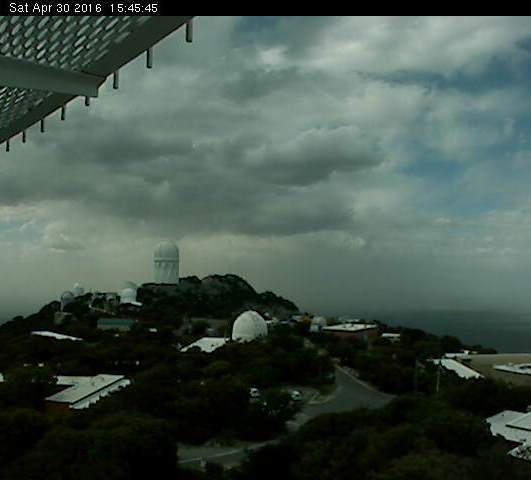 Webcam view above is looking north from Kitt Peak, and below is similar from campus. The composite radar at bottom (from PHX) is from just before 3:00 pm MST. There is a smell of rain in the air here and I'll hope for a late afternoon sprinkle or shower. First - Mike Leuthold's WRF forecast discussions will be posted at http://arizonawrf.blogspot.com/ this spring and summer. 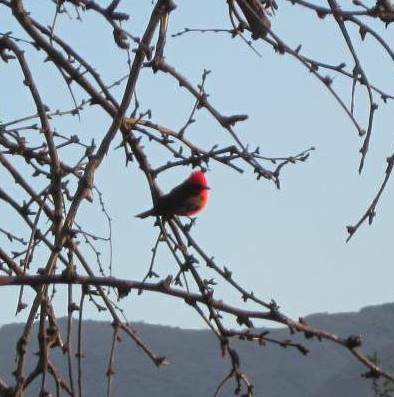 He did a post yesterday that keyed on the possibility of thunderstorms and winds this afternoon in Pinal and Maricopa Counties. This morning's newspaper headlines actions by the ADOT after several crashes in blowing dust on I-10 east of Tucson. In this day of high-resolution observations, model forecasts, and grid point forecasts from the NWS (as well as inexpensive webcam capabilities), the ADOT will apparently implement a 1950s kind of action. They plan to change the I-10 speed limit from 75 to 45 mph along a stretch of the highway from Bowie to San Simon, Arizona. 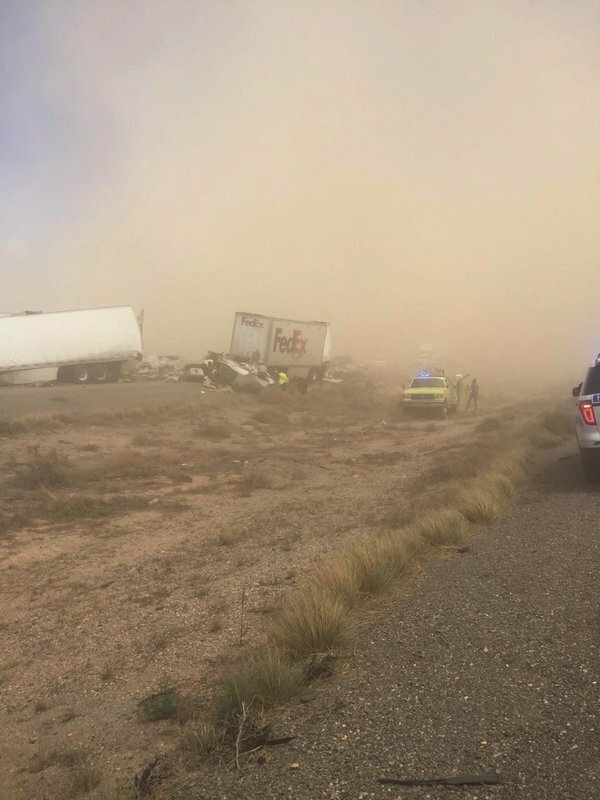 Of course, the next traffic incident may well occur in some other dust-prone section of I-10. Another closed low at 500 mb will swing across Arizona today, producing more unsettled weather for the last day of April. The 12 UTC NAM forecast above is valid at 5:00 pm MST this afternoon and indicates a quite strong vorticity maxima with this low. The current NWS Tucson forecast of maximum wind gusts expected this afternoon is shown below, and indicates strongest wind gusts along the Borderlands from Nogales east to New Mexico. Last night's 06 UTC forecasts from Atmo's WRF model continue to forecast thunderstorms over parts of Pima, Pinal, and Maricopa Counties this afternoon. The forecast of composite radar echoes above is valid at 6:00 pm MST this afternoon (note that reds indicate storm reflectivities above 50 dBZ). The model forecasts strong 10-m winds (below, valid at 5:00 pm) from central Pima County northward into Maricopa County - red areas indicate wind speeds of 30 kts (35 mph) and higher with gusts likely increasing speeds substantially. If the model proves accurate, the infamous blowing dust zones between here and Phoenix may be active this afternoon. Both the NAM and GFS versions of the current WRF forecasts keep the shower and thunderstorm activity to our north again, but with the Catalinas having some chance for storms. Although forecast CAPE (forecast skewT below is for PHX and is valid at 4:00 pm this afternoon) is small, storms would be high-based and with cold updrafts, favoring growth of graupel and perhaps small hail - thus the forecast of high reflectivities. Our interesting weather continues, but the rain gauge here at the house remains empty except for dead spiders and dust. In addition to the winds yesterday (many gusts of 40 to 50 mph across southeast Arizona) there were late afternoon showers and a couple of thunderstorms north of the Catalinas. 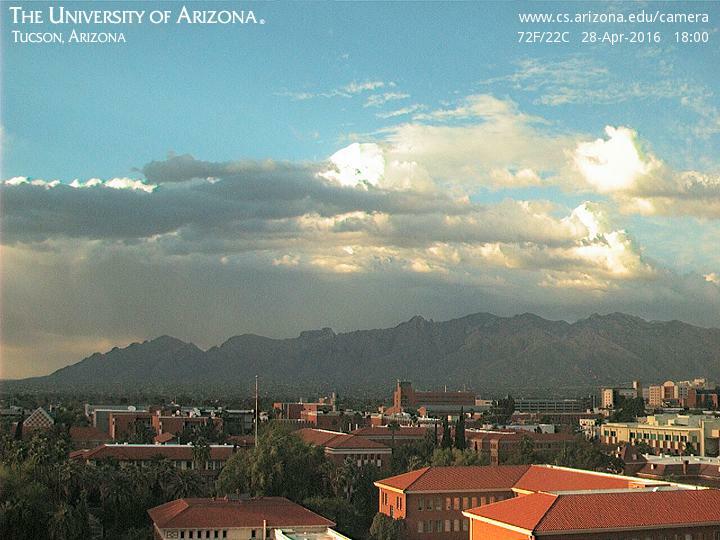 The composite radar chart above is from 5:40 pm MST and the webcam view of the Catalinas below is from campus at 6:00 PM. There were several cloud-to-ground lightning flashes detected in Pinal County. 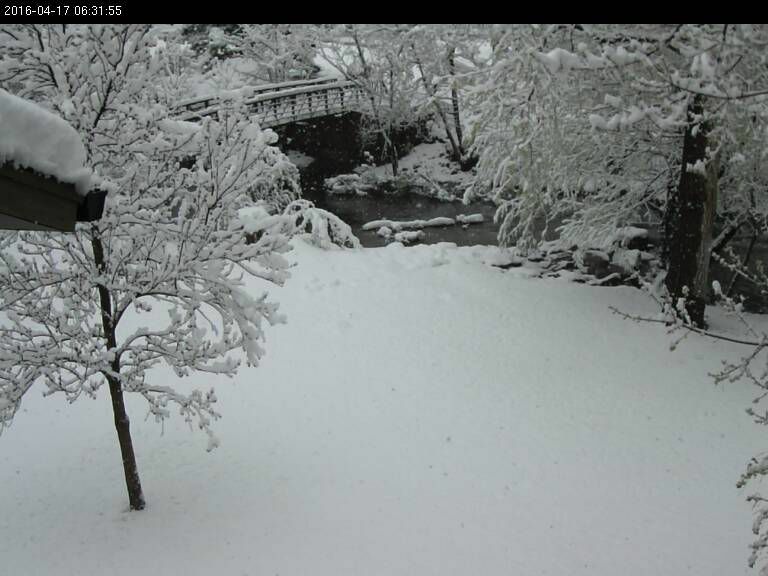 But basically, April is closing out with no precipitation here since April 12th - will May bring another event or two? Over in the southern Plains, there were more severe thunderstorms. The radar image below shows a spectacular hook echo north of Amarillo Texas. The storm apparently produced very larg hail but no reports of tornadoes. The slight chance of sprinkles and showers mentioned yesterday seems to have evaporated, according to last night's various model forecasts. The GEFS ensembles (above) have flat-lined through the 5th of May and neither the 06 UTC WRF-GFS or WRF-NAM forecast any precipitation in southeast Arizona today. Below is WRF-GFS forecast of precipitation through 5:00 am MST tomorrow morning. However, winds continue in the forecasts - below shows WRF-GFS forecast of 10-m winds valid at 1:00 pm this afternoon. Current NWS forecast for airport grid continues with a 10% chance for precipitation and thunderstorms, as well as wind gusts as high as 33 mph. The forecast also indicates a Red Flag Warning for the airport, but the warned area is well east of the metro region. 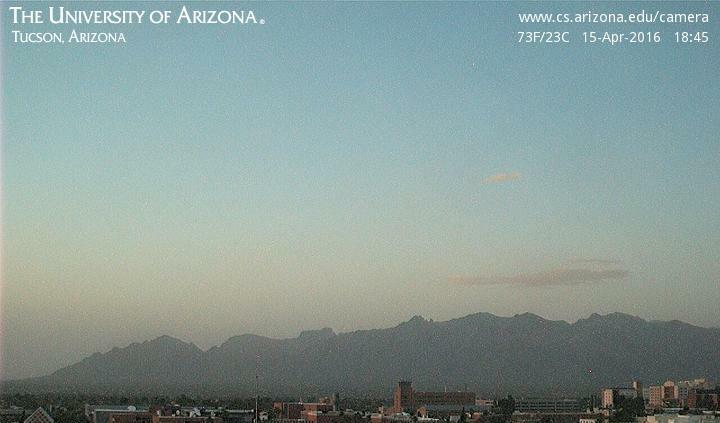 Yesterday's dust persisted into the night, but skies are much cleaner this morning. The next in our series of moisture-starved short waves and fronts will be coming by tomorrow. The WRF forecasts from Atmo at 06 UTC last night forecast a bit different outcomes for tomorrow wrt the chance of sprinkles or showers. The GFS version is dry and keeps showers well to our north; however, the NAM version develops some light showers over parts of the metro area - graphic above shows the WRF-NAM forecast of precipitation through midnight tomorrow. Current NWS forecast for the airport grid point tomorrow is for a 20% chance of measurable precipitation, as well as possible thunderstorms. The models agree that winds will kick up substantially tomorrow and below shows the WRF-NAM forecast of 10-m winds valid at 3:00 pm MST during the afternoon. The 12 UTC MIMIC analysis (from CIMSS at University of Wisconsin) of PW illustrates our current situation. Very dry air continues to dominate to our southwest, while weak plumes of higher PW air make it to California but weaken as they move southward toward northern Baja. Very moist air remains far off, south of 20 degrees north. So question is whether a late spring system will be able to pull the more moist air our way. The dry and windy regime is, of course, very typical for this time of year. Finally, yesterday was an active thunderstorm day, with almost 500 reports of severe events (below from SPC). The early morning MCS persisted and produced severe storms eastward to the Appalachians. Dirty Air Locally - Severe Storms Central U.S. Considerable dust hanging in the air this morning with the Rincons just barely visible from here and Santa Ritas totally obscured. 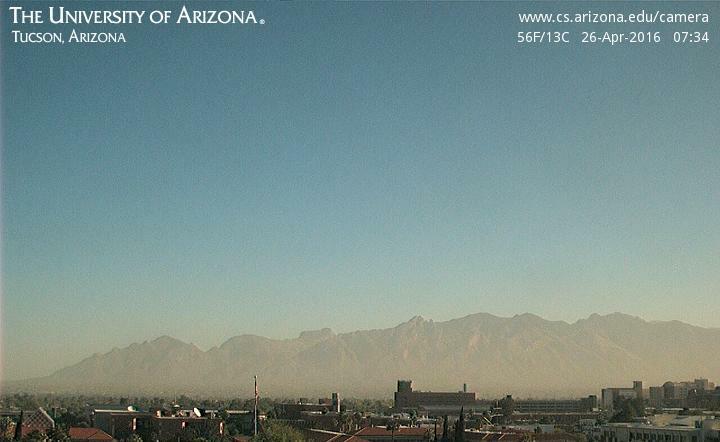 Early morning view of the Catalinas from campus is shown above. Hopefully cleaner air will blow in from west and northwest later today. Winds continue to be main weather as April comes to an end. The WRF runs at Atmo from 06 UTC last night indicate some showers with next system but from the Catalinas north and northeastward. The WRF-GFS forecast of 10-m winds (below valid at 2:00 pm MST) indicates another strong wind day for Thursday. Meanwhile, an early morning MCS is moving across Missouri and Iowa (above is 1415 UTC IR image and below is 1435 UTC regional radar - base scan from NCAR RAL). This system produced severe winds and hail in the Kansas City area early this morning. Note the small, cold blip near Oklahoma City - severe thunderstorms are already developing in that area also - looks to be a very active storm day as morning upper-air soundings over the southern and central Plains are very unstable. The current outlook from SPC is shown at the bottom. Photo above sent by Mike Leuthold (taken by state trooper) shows blowing dust and a three-semi wreck near San Simon that has closed I-10 this afternoon. Will likely be some unhappy FedEx customers this week. 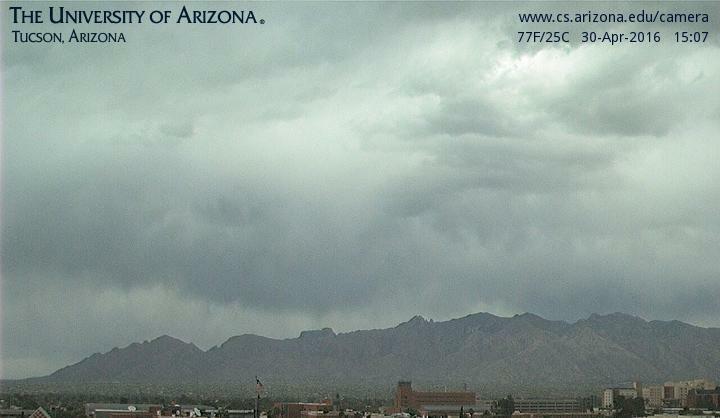 Several sites have reported gusts to near or above 50 mph this afternoon across southeastern Arizona. Meanwhile, David Blanchard reports thundersnow in Flagstaff area and flash density chart below (from weather.graphics and Vaisala) shows considerable thunderstorm activity in the Southwest, especially Utah. Many are suffering from allergies locally in the wake of a number of windy and dusty days, and there seems to be little relief in sight. The 06 UTC wind plumes from the GEFS shown above forecast several windy days from now through May 2nd. The 06 UTC WRF-GFS forecast of 10-m winds (below on the 5.4 km grid valid at 4:00 pm MST this afternoon) forecasts a very windy afternoon across most of the Southwest. The low humidity over much of the region combines with the winds to produce dangerous wildfire conditions, as per today's outlook (bottom) from the SPC. Back in 1972 the USAF sent me to Colorado State in a program designed to get Officers advanced degrees. 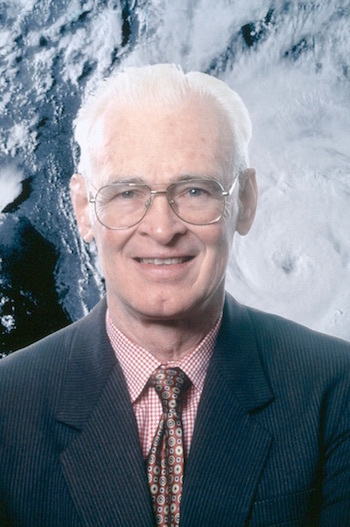 I had been out of school since 1966, working as a forecaster, first for the U.S. Weather Bureau and then for the USAF. I was very interested in severe thunderstorms, since my forecaster job was in the Military Weather Warning Center, where we issued forecasts for the U.S. mainland of severe thunderstorms and tornadoes. When I got to CSU I talked with Bill Gray. He was interested in what I’d been doing and also had a side interest in tornadoes. So he became my M.S. advisor, and I did some simple research related to observed upper-air soundings taken close in time and space to tornadoes. He was my much-needed guide into the maze of academia and research. I was very lucky, and we hit it off since all the work I’d been doing was very keyed to observations, as was most of work related to tropical storms. Bill was a very enthusiastic advisor and would run down (literally) to the graduate student office nearly each day and ask each of us what we’d learned since we last talked. Although we’d shudder when we heard him coming, his intense interest in each of us was very positive and also fairly unusual. He had a personal philosophy he preached to most of us – “In your briefcase always have: 1) a 2-B pencil, 2) a pink pearl erasure, and 3) a tephigram* [we favored skew Ts at MWWC].” I took his advice to heart and to this day I have a skew T folded up in my travel bag. The 18 months I spent working with Bill had a very large impact on me personally and on all I did during my career following graduate school. I will miss him very much. Quite hot here in Tucson for Earth Day 2016, with gusty winds and low RH - air conditioner set at 79 F here in book casita, and it just kicked on for a while. 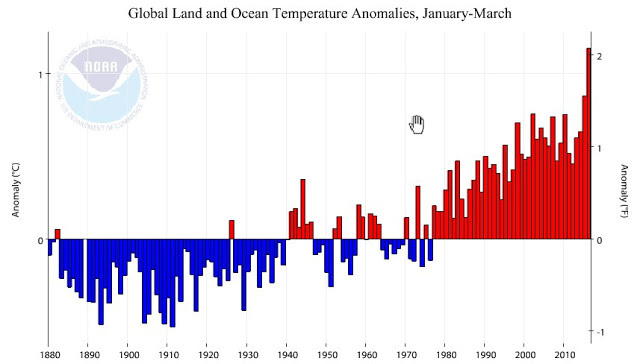 Above is plot of global temperature anomalies for a period of almost 150 years - although the precision of the measurements vary in time - the long term trend is clear. The current super El Nino appears to be having a huge impact on temperatures, so the short-term trend will diminish again as the event ends. While the details and reasons can be debated, the observations are indeed that, observations. 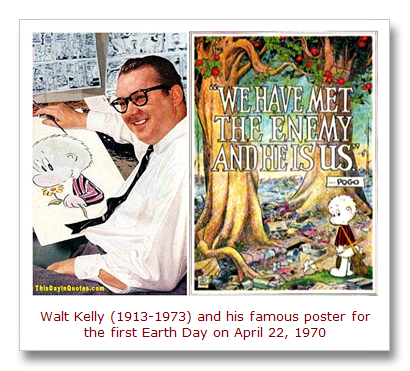 Below is cartoonist Walt Kelly and his famous poster for Earth day 1 - 46 years ago. His statement is perhaps even more true today. Meanwhile U.S. politicians like to talk about whether they "believe" the climate is warming, as if this issue were somehow a function of one's personal faith. Tweets below from super politico Trump. The GEFS forecasts from 06 UTC last night keep substantial troughing over the Western U.S., as shown above on the spaghetti plot (168-hour forecast valid at 06 UTC on Friday the 29th of April). There is surprising little spaghetti over North America in this forecast package. Even though the forecast pattern for the West is an unsettled one, the GEFS continues very dry for the Southwest. The GEFS QPF plumes for Tucson (above) forecast a very slight chance of showers out at the end of the month. While the operational member (below) forecasts almost no precipitation over Arizona for the next week. So, a very mixed bag for the rest of April. 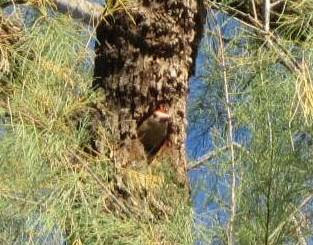 In contrast to the snows in northeastern Colorado, here are two photos from my walk yesterday morning: a Vermilion Flycatcher above and a Gila Woodpecker peeking out of its nest hole below. eerie solar glow coming through the dust. The NWS forecast of gusts to 43 mph was too high for the airport today, but it is not clear how strong the gusts actually were. The hourly observations indicate a max of 33 mph (as do the obs at Atmo), but the 0153 UTC airport observation seems garbled. Other maximum gusts around southern Arizona were: Guthrie 52 mph; Pioneer Airfield 49 mph; Muleshoe ranch 48 mph; Phoenix 46 mph; and Safford 45 mph. Definitely a windy and nasty afternoon. Today's weather event continues to be one dominated by windy conditions. The current NWS "Weather Story" from TWC is shown above. Critical fire weather conditions will prevail, with a Red Flag Warning in effect for much of southern Arizona (remember, if you want to see the exact area warned click on "Hazards" at upper right portion of the NWS webpage). The current grid point forecasts for the airport (TUS) are shown below (second below is graphic showing the hour-by-hour grid-point forecasts). The NWS forecasts gusts as high as 43 mph down at the airport this afternoon. On the larger scale, North America continues to be controlled by a complex, blocking pattern - major impact of this being the weekend threats of heavy precipitation to our north. The chart below shows the GEFS average 500 mb heights valid at 12 UTC on Monday morning, the 18th of April. The pattern shown features a lower-latitude Omega Block over the eastern U.S., with a very large Rex Block over western North America. A Rex Block is characterized by a high latitude ridge and anticyclone, with a lower latitude cyclone situated beneath the anticyclone. An Omega Block is one in which the ridge height contours resemble the Greek letter "Omega." Cool And Windy Here - Colorado Watch Out! Have taken a look at several forecasts this morning from the WRF-GFS on the 5.4 km grid from Atmo. Here in southern Arizona the most immediate impact of the strong and cold 500 mb low that is digging into the Southwest will be winds tomorrow and cooler temperatures through the next several days. Forecast above is of 10-m winds from the 06 UTC forecast run valid at 4:00 pm MST tomorrow. Forecast below is for 500 mb from the same run and valid at midnight tomorrow night. The 500 mb low is forecast to be over/near the White Mountains at that time, After that it meanders northward and even a bit westward as it lingers over the Four Corners Region during the weekend. This sets Colorado up for a precipitation event that could be really huge. The WRF-GFS forecast above (from 00 UTC run last evening) is for total precipitation though 3:00 pm MST on Sunday the 17th - oranges to red indicate amounts from 2.5 to 10 inches. Below is the same forecast, but for snow accumulation - the Front Range and northeastern Colorado into the Nebraska Panhandle really get dumped on - oranges to purples are forecasts of snow amounts from 2 to around 3 feet.